What is SLCT20 - Capital Ring Walk? 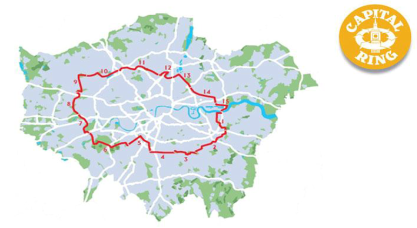 The Capital Ring Walk is a 78-mile circular route around London consisting of 15 easy-to-walk sections (from 4 to 8 miles long) through London's finest scenery including open spaces, nature reserves, Sites of Specific Scientific Interest and more. SLCT20 - Capital Ring Walk will walk 1 section per month thereby completing the Capital Ring Walk over the course of this special 20th Anniversary Year. When does SLCT20 - Capital Ring Walk take place? There will be one walk per month, on the 20th day of each month, starting in November 2017 and finishing in October 2018, with additional walks on the Bank Holiday Mondays in May and August in order to complete the Capital Ring by the end of the Anniversary Year. How does SLCT20 - Capital Ring Walk help Shining Life Children's Trust? Your donation could pay to set up a children’s club, building children’s confidence and self esteem and enabling them to work together to address the inequalities they experience, or pay for health workers to teach a community about basic nutrition and hygiene. Why should I do SLCT20 - Capital Ring Walk? SLCT20 - Capital Ring Walk will help Shining Life to improve the lives of disadvantaged children in Sri Lanka. In addition to this, it is a great way to discover unfamiliar parts of London and learn about its history, landscape and wildlife, whilst keeping fit and meeting other walkers. The start and finish of each section is easily accessible by public transport, the walks are not too challenging, and many are wheelchair and pushchair-friendly. How do I register my interest in SLCT20 - Capital Ring Walk? You can register for a section of the walk by emailing us by the 13th of each month. To make your donation please click the button on the right which will take you to Paypal to complete the transaction. by transferring your donatin directly to our bank account: Shining Life Children’s Trust, CAF Bank, West Malling, Kent. by bringing cash on the day. How can I show support for SLCT20 - Capital Ring Walk without walking? You can sponsor the walk by visiting our dedicated fundraising page here: https://mydonate.bt.com/events/slct20-capital-ring-walk/451002. If you have any questions about SLCT20 - Capital Ring Walk, please contact us.